ESPN’s Seth Wickersham and Don Van Natta Jr. have a great track record of illuminating the shifting and engrossing dynamics among the NFL’s owners—it was they who reported on the revenge motive behind the Deflategate punishments, and they who explained how Jerry Jones was the driving force behind relocation—and they’re back at it today with a tick-tock of last week’s league meetings in New York on how to deal with the national anthem protests. It is, as always, supremely worth your time. The through-line of the story is a battle, not between owners and players, but between a group of owners intent on ending the protests to protect their bottom lines, and a faction led by Roger Goodell(!) that appears more sympathetic to players and surprisingly willful about defending their right to protest and trying to turn their anger into something constructive. [T]he commissioner moved around the room to guide the conversation about [the plan’s] pluses. Many times he told the owners they weren’t hearing the players’ core arguments. “We’re all in this together,” Goodell told them. The players and the union executives, who have been at odds with Goodell for years, were impressed. “It was the proudest I’ve ever been in the NFL,” one owner said later. This was Goodell leading in a manner they’d rarely seen: He was not playing a zero-sum game, he was not risk-averse and his compassion clearly lay with the players in the face of severe pressure from hard-line owners and business executives. The owners for the first meeting with players were carefully selected; they did not include the most vocal critics of the protests. Those owners would have their say at the next day’s meeting, which involved no players. And to no one’s surprise, they were spoken for by Jerry Jones, the shadow commissioner, the true most powerful man in the NFL. It was Jones who had earlier threatened to bench any players who knelt for the anthem, and Jones appeared to be trying to whip up support for a leaguewide diktat to demand the same fealty across the NFL. [Washington owner Dan] Snyder spoke first. He said that there were real business issues at stake, and he mentioned that in his market, the defense industry and other sponsors were angry about the protests. He didn’t put any dollars on it. To many in the room, Snyder’s speech felt like an opening act for the headlining band. As Jones spoke, Snyder mumbled out loud, “See, Jones gets it — 96 percent of Americans are for guys standing,” a claim some dismissed as a grand overstatement. [Texans owner Bob] McNair, a multimillion-dollar Trump campaign contributor, spoke next, echoing many of the same business concerns. “We can’t have the inmates running the prison,” McNair said. A funny thing happened after Jerry Jones made his speech: other owners pushed back. [Patriots owner Robert] Kraft, who is close friends with Trump, politely rebuked the hardliners, saying that he supported the league’s marketing proposal and predicted the issue would work itself out over time. This argument seemed to find a receptive audience in the room. An unofficial count had only nine owners in favor of a mandate, though the reasons for the opposition varied: Some owners had tired of Jones always commandeering such meetings; some were jealous of his power and eager to see him go down; some saw the players-must-stand mandate as bad policy to invoke in the middle of the season; some owners were angry with Jones’ hard-line public stance on kneeling, feeling that it had backed them all into a corner. “The majority of owners understand this is important to the players and want to be supportive, even if they don’t exactly know how to be supportive,” one owner says. Now, suddenly, Jones found himself in an unfamiliar position: He wasn’t getting his way. He knew it, and everyone knew it. It is hard to know what to take from these accounts, and from the meetings themselves. Some owners and even some players seemed pleased with the progress that had been made; others on both sides seemed frustrated with a lack of concrete steps. (There is another owner-player meeting scheduled for next week.) But the fact is that the most strident owners against players’ right to protest did not get what they wanted. That feels like a victory. Jones is no lion in winter, though. Before the meeting broke up for the day, the owners moved on to other orders of business, including the negotiation of the commissioner’s next contract. Jones is not actually on that committee...but he has inserted himself into the negotiation, and wields more power on it than anyone. And in that meeting, Jones spoke for 20 minutes about the league’s, and by implication, Goodell’s issues and failures—and pushed for Goodell’s next deal to be much more incentive-based. Jones would have Goodell earn his paycheck, and would hang any financial blowback from the protests around the commissioner’s neck. 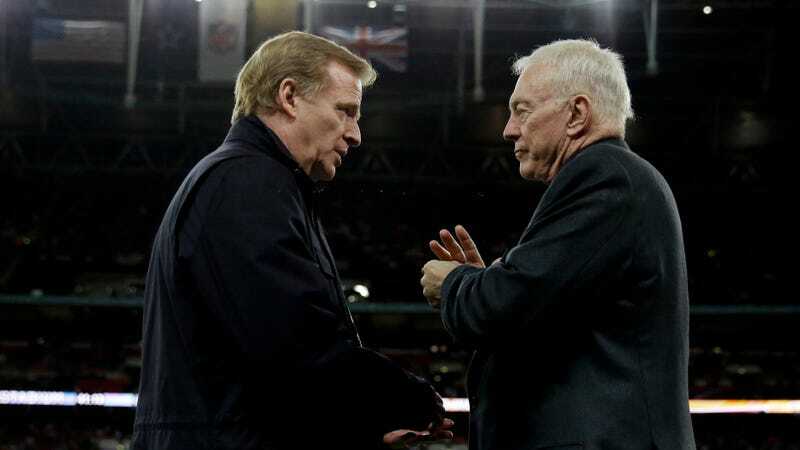 There are costs for doing what you believe to be the right thing; there are costs for crossing Jerry Jones.